I recently decided to get some small canvas prints done to sell at my local tourism office. 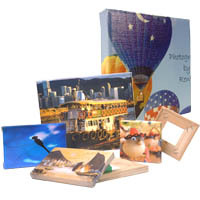 Artscow.com had a special offer for 8″ x 10″ stretched canvas prints at $US9.99 delivered to my door. I live in Australia so this sounded like a good deal. Printing on canvas is a good option when you want your photographs displayed proudly without the hassle of getting them framed. They arrived after about 2 weeks and seemed of reasonable quality. Unfortunately when I went to deliver them, it was raining slightly. Although the prints were inside a plastic bag, in the process of unpacking them a few small drops of water got onto one of the prints. To my horror, as I brushed the droplets off gently, the ink just lifted off. Needless to say the prints weren’t required by my cusomer until a solution can be found to make them more water resistant. After some testing, it appears all canvas prints aren’t created equal. Here is a video showing how easy the Artscow prints are to damage with even a small amount of moisture.